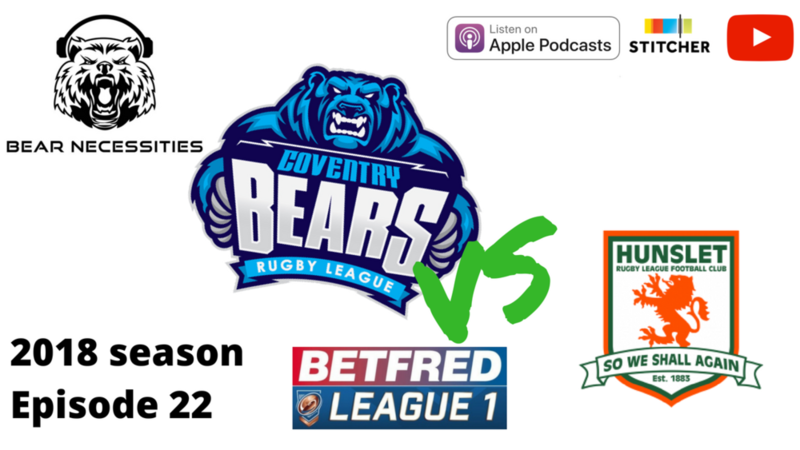 We look back on the Coventry Bears’ 40-16 defeat away to Hunslet in Betfred League 1, including hearing the post-match thoughts of Bears head coach Tom Tsang. On top of that, we also discuss the Bears’ new dual registration agreement with Super League’s Hull Kingston Rovers, we reveal the musical lineup that will be keeping your ears happy after the Bears’ upcoming home game against the Bradford Bulls and Dave reveals his Bears team of 2018 so far. We live at covbearspodcast.com, we’re @covbearspodcast on Twitter and you can subscribe to our show on YouTube or in your favourite podcast app. This is the world’s greatest podcast about the Coventry Bears. This is Bear Necessities.